BRYAN EATON/Staff photo. The First Religious Society, Unitarian Universalist, of Newburyport sponsored a second holiday “Gift of Giving” event at the Bresnahan School. Children from the YWCA after-school program chose and wrapped free gifts for their parents which were provided by the FRS and local community members. 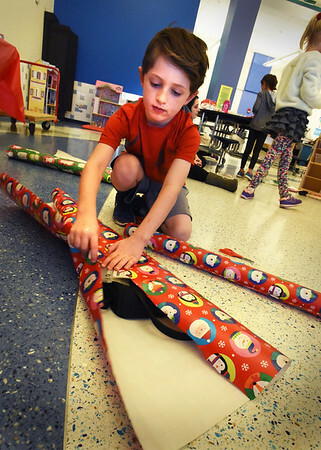 Ethan Malio, 7, wrapped a present for his father during the Wednesday afternoon event.